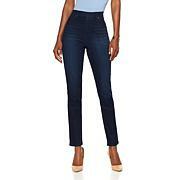 Ladies love the fit of DG2 boot-cut jeans, and we think you will too. This particular denim has a high percentage of cotton for that classic denim feel. The slimming, leg-lengthening boot-cut silhouette flatters every body type, and it comes in three lengths — no hemming required. I really loved the comfort fit of these jeans the only complaints I have had about the DG2 jeans is the front pockets need to be deeper and I wish they came in a shorter size. I am only 4'5" tall I wear a 23" length in pants and that puts them at the top of my shoes. I have to cut off at least 4-6 ' and when the designs are at the bottom of the pants leg that gets cut off. Usually when you buy pants with designs that is the main reason you buy them. But I would recommend DG2 jeans to anybody. Love love love these! I do agree with other reviews to order a size down for a perfect fit. I'm usually a 10 but had to return for an 8 which was perfect! Got the dark wash now I'm getting the lighter one! 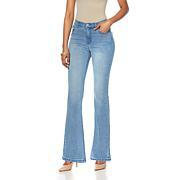 DG2 Jeans are THE BEST fashion jeans on the market. I have purchased around 30 pair and have loved every one of them. The quality has always been great. They fit perfectly and last forever. Truly a great purchase! I'm a DG2 girl for life!